This year the quartet is back with the album that puts their rock music back on the map. After signing to VSR Music Group in 2013, the band dropped We Are The Broken with mixed success in my opinion (read my review here!) and now a new EP has released. 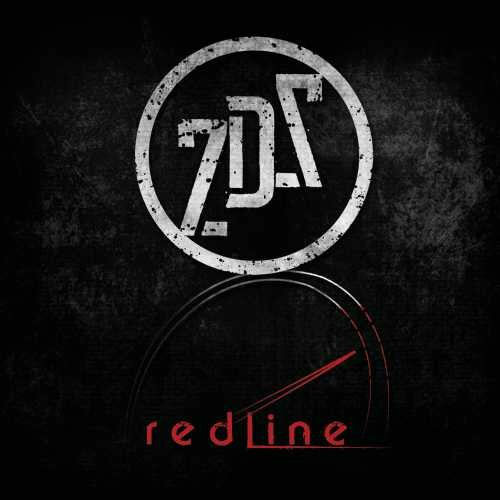 Though only 16 minutes long, Redline has the band truly diving back to their rock roots, with passionate vocals, explosive guitar solos and a musical trip back to the past, and the sound that we all loved and admired. It’s a step in the right direction for fans who loved the edgier, harder rock sounds of Seventh Day Slumber (although if you love worship music more than rock, then this album may not be for you! ), and I commend the guys for recording an album that not many people expected considering the immediate previous CCM/pop/worship related material. To say that I received a headache and had to listen to the album opener “Bring It On” in about 5 or 6 parts the first time around is probably an understatement, but with passionate and intense screams and explosive guitars and a heart and zeal for Christ that is evident from the first second, the band’s first offering needs to be heard to be believed. Playing out like something RED or Skillet would record, the theme of the song to me is very encouraging and inspiring, even if the music wasn’t to my own liking. The fact that the guys are speaking out and singing to adversaries and/or the devil, saying to bring their best shot because God will win the war and that He will be triumphant; speaks volumes about the band’s unashamed faith. Though the song won’t be everyone’s preference of choice, there’s no denying the truth in the message presented, and for that alone I commend the band. “Gone” is next, and is relatively more subdued than its predecessor, but is equally intense and poignant thematically and lyrically. As Joseph vibrantly and emphatically sings about coasting through life and being on autopilot, he recounts and laments that ‘…we’re so lost, we’re so gone, we’re so far from arms I never thought could reach…’, yet provides hope and comfort with the reminder that ‘…Your blood stain, amazing grace, that pulled me from the edge, of an everlasting sleep…’, implying that God in us makes us alive, therefore we ought to be thankful and grateful for the sacrifice that God has given to us. The midpoint of the short but punchy EP brings us a cover of Temple of the Dog’s “Hunger Strike”, lyrically and thematically about how we as human beings should express thankfulness and gratitude for what we have, while somewhere else in the world ‘…the fire’s cooking, and they’re farming babies, while the slaves are all working, blood is on the table, the mouths are choking, and I’m going hungry…’. Sung with Kevin Young from Disciple, Seventh Day Slumber really makes us think with this song, despite the fact that this is not a Christian song. “I’ll Bleed” and “Lost In The Lights” end the EP the same way that “Bring It On” started it- raw, unpolished, unfiltered, passionate and sometimes head-hurting rock. While I myself would not subject myself to an extended run at listening to hard rock or even metal, others may, so kudos to them, and kudos to SDS for focusing their EP on that portion of the population who love a good rock song. Thematically, “I’ll Bleed” speaks to a bully, and reminds us that God fights our battles and that we can overcome anything we Him, even when we bleed; while the final melody “Lost In The Lights” includes synths and programming galore on top of guitars to creative a dance/rock unique experiences. Relaying that sometimes we can be lost in the lights, our views and values distorted from spending too much time living vicariously through the lives of the famous, Joseph reminds us that God can restore to us what was once broken, and fix our world view so that it only relies on Him and Him alone, and that fact alone is worth the entire listen to this EP! Well done guys for jumping out of the box and providing us with a snapshot of what we have been missing for a while- edgy rock music with inventive lyrics. When I’ve ‘bagged’ previous worship albums of theirs unintentionally, would anyone believe me if I like Seventh Day Slumber’s latest EP? Though I prefer We Are The Broken as a rock release lyrically, Redline personally shows the best of Seventh Day Slumber musically. Obviously not going to win out on sales a day where Sanctus Real drops their last album with Matt Hammitt at the helm, Andrew Peterson releases his brand new studio album via Centricity Music, and MercyMe and Laura Story both unveil Christmas projects; I believe that Redline serves as a welcome and enjoyable alternative, for listeners who want more musical variety and edgier rock tunes. While I loved the return to rock, at the same time I was missing the worship as well. The jury is still out as to whether Seventh Day Slumber’s vertical worship days are behind them, given that this record is guaranteed to be very popular and respected; yet all I can say is when another worship album releases, let’s hope pray it’s more along the lines of Take Everything…or Kutless’ past three albums (It Is Well, Believer and Glory)! So are you a fan of Redline? Let us know in the comments below!